Free Halloween Science Coloring Pages! 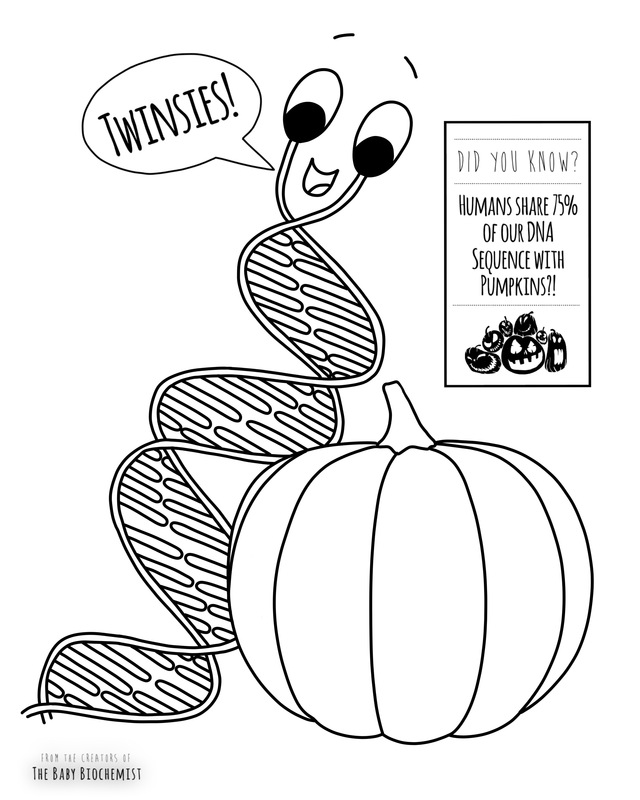 Here are some fun science-themed Halloween coloring pages for your little ones…or you! This year, we chose to do pumpkins, bones, and spider webs– the quintessentials of Halloween decorating. Below is a little biochemistry about each topic and some activities to do with each page! Our DNA is the instruction manual for our cells. DNA may seem like such a complex thing, but it really is only a string of 4 different molecules attached together to make a code. All life on Earth uses these same molecules. When a cell needs to do something, like grow or move, it makes large molecules called proteins to accomplish these tasks. Our DNA is the instructions to make these proteins (side note: we are finding there is more to our DNA code than just this, but this is an incredibly important function). If you compare a human genome (sequence of DNA molecules attached together) to that of a pumpkin, you would find that we share 75% of the sequence! This suggests we each have proteins that do similar things, and that’s true. But, we are animals and they are plants, after all, so how can this be? As you can imagine, that leftover 25% is coding for some pretty important stuff like…I don’t know…A BRAIN? A HEART? Also, some of our proteins are similar in some ways (so we’ll share some part of the DNA sequence) but they will differ in incredibly important ways that separate us from other organisms. Anyways, these “comparative genomics” facts are fun and humbling to hear. We share over 99.9% of our DNA with other humans and 96% with chimpanzees. 60% is the amount we share with both chickens AND bananas. These fun facts might be a good starting point to discuss with kids how we are different from other organisms, and how are we the same. When you throw out your jack-o-lantern, put it somewhere where you can watch it decompose. Take notes about what happens and when. Check next summer to see if any seedlings have sprouted! Biological mineralization, when an organism causes inorganic salts to crystallize or precipitate, happens more frequently than you think! Humans are able to make bone and teeth, but did you know there are little bacteria that can make magnetic crystals to help them navigate? Other examples of biomineralization include sea shells, pearls, and egg shells! 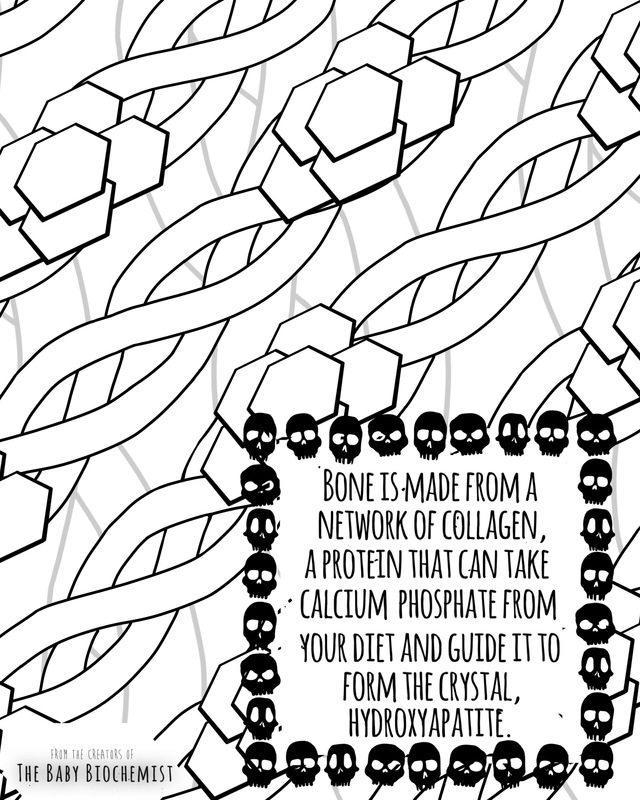 Our bones are made of a complicated network of cells that work together to mineralize organic tissue, but the actual crystallization happens on a ubiquitous protein called collagen. You may have heard of collagen in beauty product commercials. It is a protein made of three strands that wrap around each other, forming a triple helix, and is responsible for give tissues elasticity. You have cells in your bones called osteoblasts that send out perfectly arranged networks of a certain type of collagen. This forms an ordered network on which to grow the crystals in your bones. Osteoblasts then help to send out calcium phosphate over the collagen network. Calcium phosphate is a water soluble form of calcium derived from the foods you eat. The arrangement of atoms on parts of the collagen network sort of act like a magnet to trap and carefully arrange the calcium into a crystal form called hydroxyapatite. The beautifully ordered network of flexible collagen and stiff hydroxyapatite is what gives your bones resilience and strength. It is a truly amazing process that I definitely took for granted until I learned more about it! Dissolve the calcium in chicken bones to just leave the collagen! Spider silk is a surprisingly strong, extendable, and resilient material, and is a true testament to the power of evolution. 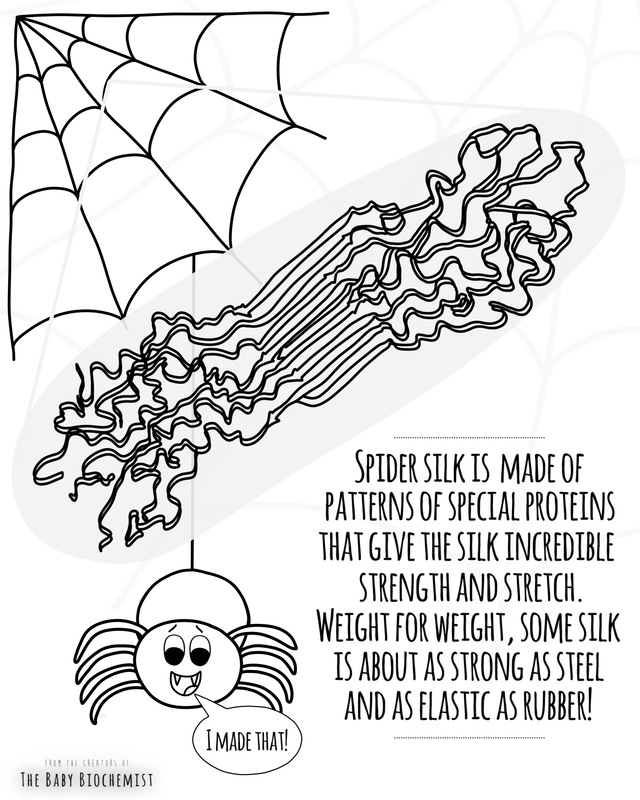 If you had an equal weight of steel and some types of spider silk, they would have similar strengths (but that would be a lot of silk, wouldn’t it?). Scientists have tried to make spider silk in large quantities, but they haven’t been very successful yet. Recently, some scientists made a model of what the proteins in spider silk may look like, and tried to help explain what gives the silk such strength and stretch. In the coloring page, you can see a drawing of the protein. (Keep in mind when you’re “looking” at a protein like this, the lines are only a couple of atoms thick!! Proteins are very small!) In the middle of the protein are straight, parallel lines. Biochemists call these “beta-sheets.” You can think of them as little sheets of velcro. The atoms in them are so attracted to each other, that they stay stuck even when something is pulling on it (like a fly trying to get away!). These structures are what may give spider silk its strength. On the ends of the protein are squiggly tangles of lines. You can think of these like curly hair– that when you pull them they stretch out, but when you let go, they snap back to how they were. This is what may give spider silk it’s elasticity or “extendability.” The proteins are attached end to end in a repeating pattern to form a very very thin strand, then many of these strands of protein are wrapped around each other to create a strand of spider silk. It is amazing that characteristics we see on the large scale can be traced all the way down to molecular and atomic origins, isn’t it? Not science, but I LOVED doing this as a kid: tape or tie yarn in a web-network in a hallway and have the kids be flies and try to get through without touching the yarn. Go outside and try to find some spider webs! Did the web catch any food? When I was young, a friend captured two spiders for a science fair. One he left alone and gave water and flies for food. The second, he gave flies, but vodka to drink. He then compared their web-making abilities…you can guess what happened, but still might be fun to try. Click here to download the Halloween Coloring 2017 PDF! Let me know how you like them and send pictures of your kids’ creations on Twitter, Facebook, or Instagram! If you’re interested in checking out any of our books, find them here! All of them are available on Amazon. Why does milk foam? The science behind your latte. Hi, I’m Cara! I am a mom, children’s book author, and PhD in Biochemistry. Here you can find ways to help bring science into your home- from books and activities for kids, to fun facts about science for you. Thanks for visiting! Brave the Elements is a participant in the Amazon Services LLC Associates Program, an affiliate advertising program designed to provide a means for sites to earn advertising fees by advertising and linking to Amazon.com. Enter your email address to follow The Baby Biochemist and receive notifications of new posts by email. ☕️ Magic Tea Party! 🦄 So I got a lot of questions about Butterfly Pea Flower tea the other day, so I thought I’d show you what it is! I was introduced to it by @theveryyoungexplorer last year I believe. It is brewed from a flower from south east Asia and makes a stunning deep blue tea. The color is caused by the presence of quite a bit of anthocyanins in the petals, which, as you may know, change to pink upon the addition of an acid! The tea itself doesn’t have much of a taste so for my daughter, I mix in sugar and let her pour in lemon juice to cause the color change. If you pour in just a little at first, as she does in the video, you can see it change to purple, too! I’m a huge fan of playing around with red cabbage juice for its color changing anthocyanins but this tea has taken its place for us once I finished the huge stash of cabbage juice ice cubes I had in the freezer 😂🙈 Not only is Butterfly Pea Flower tea easier to make but it also doesn’t smell like cabbage so 👋 bye bye cabbage cubes! We have been doing TONS of activities with this stuff so stay tuned! If you’re curious to try the tea, I got it from Amazon for like $5 or $6. There’s a link in my profile to my commonly used “home lab supplies” where you can find where to buy! I know most of the stuff I post isn’t really “set it and forget it” for kids. It usually involves quite a bit of hands-on time with them because that’s what I like, but sometimes I would like to cook, shower, and 💩 in semi-peace, so I made a little roundup of Easter egg-themed baby/toddler busy activities that we’ve been using with our youngest, inspired by the wonderful #easter_simple_play ladies! All of these I’ve setup for my 14-month-old strapped to her high chair so she doesn’t wander off if I’m not looking, but they still involve supervision, especially if the child is still mouthing things. Anyways, here are some things you can try this weekend if you’re preparing a big meal or getting ready for guests! Be sure to check out all these lovely accounts! 1. From @baby.bear.went.to.play and @sweetmommyhood: Tape a bunch of eggs to the tray! Bonus points if you put Cheerios in the eggs first. 2. From @weneedmoreglitter and @tottimeblog: Stick pipe cleaners through the holes in the eggs and give them that. Not only is it an interesting egg presentation to wiggle, but they can also try to unthread them. 3. Probably everyone😂: Fill the eggs with safe odds and ends from around the house. Not pictured because I had no good sunlight when we did these 😂: 4. Give them a toilet paper roll and eggs. (Also can include jumbo pom poms (not choking hazard ones) or Cheerios). (My 14mo loves this for balancing) 5. From @inspiration.to.play: Wrap plastic eggs in foil! 6. From @weneedmoreglitter and @saynplaycolumbus: Fill eggs with dried rice or beans and tape closed to make musical shakers! 7. Eggs and some container with a lid to practice shaking, opening closing, posting, etc! Hope these help you get something done while the Easter eggs are out of storage! 🍦Ice Cream Shop 🍦I saw the new-ish tag #sinkplayfriday on @buddiesbabiesandbiscuits and couldn’t resist setting something up! This batch of playdough was on its last leg, full of hair and general grossness, so we gave it a fitting send-off as ice cream! (or cupcakes? We kept saying both.) I also filled the sandwich baggie I was storing the playdough in with shaving cream and added an icing tip for whipped cream (or frosting?). I thought she would get into more dramatic play with this but she ended up mostly practicing piping the shaving cream and mixing stuff together. She said she invented a new floam when she mixed the shaving cream and remaining sprinkles into a big moldable ball 😂😍 Looovvee it! Our candy chromatography experiment failed, so this served as our instagramable candy play for #apopofculture with @happi_crafts this week! It was a sweet success and she’s still playing as I’m putting the baby down for a nap right now....hopefully not trashing the bathroom. 🥚Color Changing Easter Eggs! 🥚 This uses my favorite kid-safe, edible, truly amazing molecule- anthocyanin! We brewed some strong Butterfly Pea Flower tea (link in profile), added a splash of vinegar and left hard-boiled eggs in the tea for a few hours. After the eggs reached a nice blue, we removed them then let them dry. Anthocyanins are shades of blue when in alkaline conditions and pinks in acidic conditions. In the video, we dipped the eggs in vinegar (an acid), but when we were actually doing this together (for fun! ), my oldest painted the dyed eggs with vinegar to create designs. Importantly, the color change is not permanent! It eventually turns from pink back to blue after about 30 min as the acid reacts with the shell, but the whole process is so beautiful and magical that my daughter didn’t care! I suspect this would work with red cabbage dyed eggs too, but I haven’t tried it yet! If you did that this year, dip one in vinegar and let me know! It’s EGG week on #the12weeksofspring with @redtedart, @littliesactivities, and @resolvetoplay and EASTER week on #tagfromtheheart with @where_learning_meets_play and @montessorifromtheheart! Check those tags and #easter_simple_play for some great ideas for the holiday!